There’s no better way to describe Paralytic Stalks than an insane, uncharted trip through the intricate psyche of of Montreal’s front man, Kevin Barnes (and no, not that energetic, flamboyantly-dressed alter-ego you see on stage at their shows). This is Barnes exposed and at his rawest. The newest installment from the Georgia-based band is a totally unfiltered glimpse into Barnes’ consciousness—which, as the sheer lyrical and compositional creativity of their twelve album legacy has proven—is pretty complex. Paralytic Stalks takes listeners on a trip (in the most psychedelic sense of the word) with Barnes’ unprocessed thoughts on existence and personal life as the lyrics and an unconventional roller coaster of styles, sounds, and instruments as the music. And because of Barnes’ complex nature as an artist, this does not translate into an easy-listen. In other words, Paralytic Stalks by no means mirrors the poppy harmonies we see on their earlier albums like The Sunlandic Twins or Skeletal Lamping, but the fact that of Montreal’s music can’t be pigeonholed into having one distinct “sound” is one of the things that keeps die-hards so crazy about their music—we’re kept on our toes, excited to hear what the band will surprise us with next. Paralytic Stalks flows in its own right: it’s hard to tell where one song ends and the other one starts, and some of the lyrics seem like one long stream of profound, exciting, unedited thought. But one of the things that makes of Montreal such a brilliant and creative group is their willingness to experiment and venture into new territory. 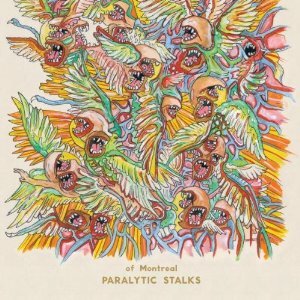 Paralytic Stalks, arguably their most personal album to date, is definitely a stretch into uncharted waters for of Montreal and for Barnes — one that avid listeners will actively embrace, and newcomers might have a hard time with.